Certain things usually sound good at first until you actually get the chance to try them out. A good example is home remodeling projects where many people have been easily lured by the idea of going the DIY route, only to end up messing things up and incurring more costs. Unless you have great knowledge on what you are doing, you are better off hiring the professionals. Here is a look at some of the reasons why DIY may not be your best option for home gutter installation. There are numerous people who get hurt as they go about gutter installation. Most of the people who have suffered injuries admit that their first thought was that DIY gutter installation will not be that difficult. 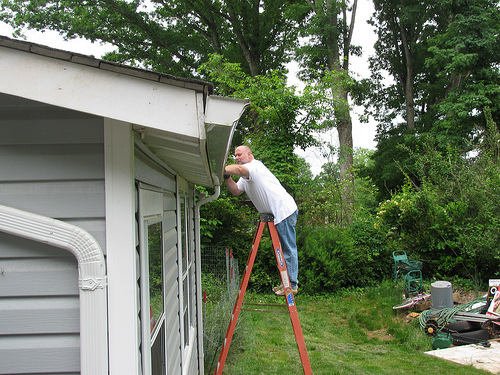 However, installation of gutters involves ladder activity and if you are not careful, you may fall and get injured. In a worst case scenario, you may suffer from paralysis after a fall from great heights. Therefore, you can save yourself the trouble of getting hurt by hiring professionals for gutter installation. Sure, after you have viewed those DIY YouTube videos, gutter installation sounds like a piece of cake. However, professionals have a wealth of knowledge and experience in matters to do with gutter installation and repair. They can easily assess your home area and pick out problems while laying out crucial details. Furthermore, they can take an effective action right away to remedy the problem and ensure your home is safe. Not so many people have this kind of knowledge on gutter and eavestrough issues like roof shingle damages, decaying fascia boards and deteriorating sidings. It is easy to think that you will save a good sum of money by purchasing your own materials and doing the repair for yourself. However, market conditions can lead to a drastic change in the price of materials pertaining to Toronto siding, adhesives, hangers, clips, downspouts and so forth. The final bill may blow your mind off. As for the professionals, they get the best deals because they typically pay wholesale to acquire all the materials that they need. That means that if you hire them, you may even pay lesser for those materials. In addition, they can easily tell the difference between original and counterfeit products. After you have purchased all the materials you require for gutter installation, you have to bring them home. This can actually be a big problem especially if you are relying on your car. Supposing you owned a pickup, it would still be challenging to transport sections of gutter that are ten-feet long. This is because most vehicles do not come with specially fitted racks for things such as gutters. However, gutter companies have the right means of transportation. Once you have made the necessary arrangements for installation services, you can trust them to transport their equipment safely to your property to start work. One of the common mistakes that most people doing DIY gutter installation make is failing to pitch the gutters properly. If the gutters are not properly pitched, you will not have effective water drainage in the gutters. However, you can rest assured of accurate gutter pitching from professionals who have a rich experience in matters involving gutters. As you can see, when you hire professionals to do the installation for you, you will not only save yourself the trouble of spending a lot of time getting all the resources together but also the overall cost of purchasing, transporting and utilizing the materials needed for the installation. In addition, you will reduce the chances of getting hurt. Professional gutter installation services guarantee you a durable gutter system that will keep your home safe during a heavy downpour, so why take the risk and jeopardize the benefits you can enjoy by going DIY? Think, folks! What’s The Best Time To Carry Out A Biannual Gutter Inspection? How regularly do you carry out a gutter inspection for your house? The four distinct seasons pose a challenge to properly functioning gutters. For this reason, you need to get a professional to inspect your gutters at least once a year to keep an eye out for any potential problems that may occur. Unfortunately, most home owners overlook the importance of carrying out gutter inspections since they are designed to be inconspicuous. Gutters are designed to drain large volumes of water from the roof and in case they develop problems, this can quickly turn into a calamity. So when exactly is the best time to carry out gutter inspections? Most of us want to curl up by the fire while we enjoy a cup of coffee as it rains. As good as this may sound, you can also use this time to check your gutters. While it is raining, go around the house and check how well the gutters are draining water. 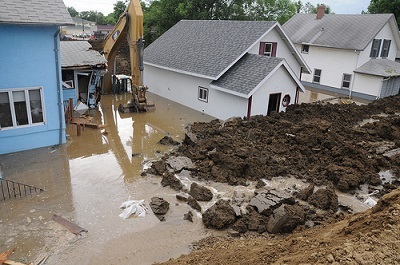 Check the drainage around the foundation and check any signs of pooling anywhere near the house. Follow the water drainage to see if it is flowing away from the house or not. Next, check the downspouts to see if the water is running outside. Carefully inspect to check for gaps or cracks along the joints or elbows of the downspouts. Make sure that the water from downspouts is being directed to the splash block. The splash block should then direct water away from the house at least 2ft from the external wall. You should also check if the gutters are well secured and if there are any leaks. Fall is a good time to spend time outdoors as you enjoy the fall colors around you. Use this time to go around your house and inspect the gutters and downspouts. Check for any possible rusting or loose screws along the gutters and downspouts. Go around the foundation of the house and clear any shrubs to check if there is any water collection. If you notice discoloration on the external walls, check if there are any holes in the gutters that may be causing possible leaks. If you notice any gaps between the fascia and gutters, it’s time to call for a professional who specializes in soffit and fascia in Toronto. He will carry out an inspection and advice whether to repair or replace the fascia to avoid leakages. Most people prefer to carry out gutter inspections during the spring. The weather is warm and it is considered a safe time since there are no strong winds. Use this time to clean out the gutters. It is advisable to call in the experts to carry out the inspection since they know what and where to check. If you prefer doing it by yourself, ensure that you have the right gear to ensure your safety. You will need to put on gloves and protective glasses during the cleaning. Use a ladder to get to the gutters and clear out the leaves and debris using your hands. After clearing out the debris, direct water to the gutter using a hosepipe to clean out remaining dirt and while doing this check for any possible leaks. Ensure that no debris is blocking the downspouts and that water is flowing freely. Check the fascia for any signs of rot or moisture. If you find any problems, do not hesitate to call the professionals for a quick fix up. Never allow your gutter to stay for long without being inspected or repaired. Delaying will lead to more damage to the gutters and around the house. In the end, you will end up splurging more cash on repairs. 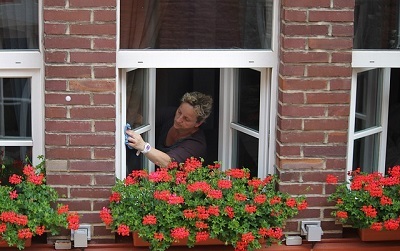 Want To Get Home Cleaning Services In A Stress-Free Manner? Cleaning services are a good thing because they relieve you of certain strenuous tasks. On countless occasions, people admit to pushing off the days that they were going to do a certain task. It is quite understandable that some people have busy schedule and creating some time to do gutter or eavestrough cleaning may sound next to impossible. Cleaning services come in at this crucial point to make the unutterable task easy and manageable. Although they are merely a call, text or email away, you need the assurance that the people you entrust with the task of handling your soffits and fascia as well as gutters not only have a reputable name for good cleaning services but are trustworthy enough to account for your home. Picking the right professional people to handle the cleaning may be a major decision for you. Doing your homework right will help you hire the right guys for the job. You need to know whether the people who will be cleaning your home are employees or contractors. This has to do with the assurance and protection that you get by involving professional services. Gutters and eavestrough need attention and some bit of knowledge. Therefore, if it is an individual working on your gutters, the result may be great but will take some time. Team of workers will do a similar task within a short time especially when there is great coordination in it. In some cases, people who just hire cleaners without some digging end up dealing with burglary cases or losing valuable goodies. Good homes always have nice gutters that may be tempting to some workers. As you go about looking for cleaning services, the company that offers you service needs to affirm to you the precautionary and caveat measures they take to check the history record of their employees. Performance of background checks gives you confidence and leaves you with less questions about people who will come to clean your home. Tick this off your list before making any choice. Insurance is as miscellaneous as the clouds that roll by every day. For the task at hand, you need to make sure that there is general liability insurance as well as workers compensation. A polite request for an insurance will not taint your image in any way but give you the peace of mind you need after entrusting your home to a cleaning company. Notwithstanding, the company should be more than willing to hand you the certificate. The reason why you go looking around for home cleaning services for gutters, compound and garage is because it is a need that requires your time, which you barely have. Therefore, find out if there is customer satisfaction guarantee offered. By doing this, you will know the exact length of time you need to wait before making calls to report certain issues that you may come across after the task is over. The fact that humans are bound to err needs to motivate you to follow up with the satisfaction guarantee just in case the employees wake up on the wrong side of the bed and perform poorly, the company plays it role in making it right. All company policies regarding the person who entirely holds the responsibility for carrying your home key need to be on your fingertips. Find out how the company acts on its policies in case there is a problem such as misplacement, loss of keys or its duplicate. Of all the things that people find hard to do, this is one weighs heavily. Do not wait until the minute of need and desperation. Act earlier and get it all right before giving the key out. It is paramount for you and the company you choose to be on the same page from the word go. In other words, the supervisor needs to walk you through their services, policies, costs, refunds, compensation just to name a few. On the other hand, you need to concisely state your anticipations from the company services. If you need cleaning and replacement services for the gutters, soffits and fascia talk it out with him or her before the employees get down to it. Ironing out things at the start point will give you the results that give a bang for your buck. Cleaning the home is an essential task and is necessary every once in a while. To keep your gutters, soffits and fascia in good condition, you have to clean them and make replacements it there is need to do so. Some companies even offer services for cleaning and replacing the worn out parts of gutters in your home. Therefore, as you choose a company, your particular needs will determine the kind of service you get from them.